Proper project management can be one of the cornerstone factors determining the performance and efficiency of a project regardless of its scale, scope-of-work or end-goal. For this reason, it is highly essential that anyone in charge of project planning and project management is equipped not only with the right skill set but also the appropriate project management software. However, there are a ton of different project management tools out there, and for the layman, picking the right one can be hard. To make this selection easier, we have prepared a review and comparison of the key features provided by two highly-used project management software – Trello and Wrike. Task delegation – You can delegate tasks between user X and user Y, makes accountability easy, and assignments clear for each user. Email integration option – both apps offer multiple integrations with apps like Zapier and MailChimp. Although they are very similar in theory, Trello and Wrike tackle project management through different approaches. Here is a more in-depth look at what they have to offer and how they differ from each other. 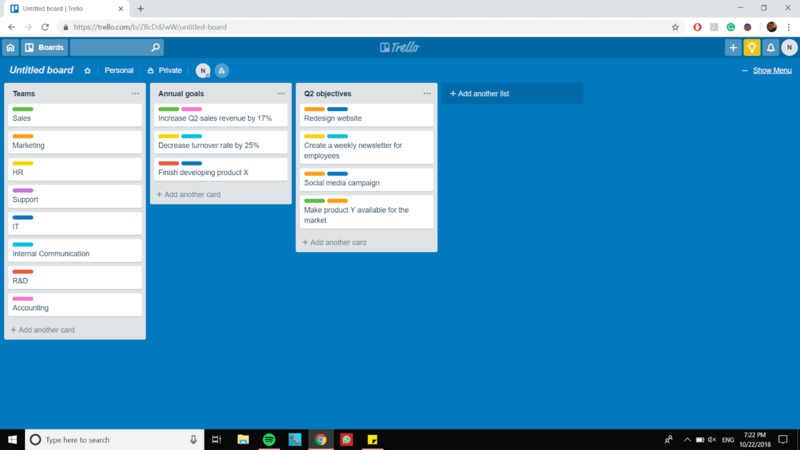 Since its launch in 2011, Trello has gained praise and recognition for its user-friendly interface and simplicity – both in design and functionality. It is a project management and collaboration tool which organizes projects into kanban-style boards. Simply put, your dashboard will essentially resemble a virtual whiteboard with sticky notes separated into columns. Trello’s Kanban style visual interface is one of its most robust features. When a board or card is managed and organized correctly, it allows one to understand the tasks on the board easily, and furthermore, better understand the progress of the project. It is also easy to customize – a background image or color of choice can be added to the dashboard at any point to suit one’s visual preferences. Adding members to a team in Trello is done by simply dragging and dropping their profile on a card or board. e.You can do the same for assigning tasks to team members. If at any point of the project lifecycle, you need to remove a specific team member, users with access to editing the board can do so without losing that member’s data. You can create labels and add them to boards. You can use these labels or cards to filter the tasks based on priority, category or any other separation that may suit your needs. You can color code them to help you quickly identify what stage a particular card or task is in, or just under what category or department it falls. Trello boards can be set to be either private, public, or customized on the team’s needs and goals. Also, a member, such as a project manager, supervisor, or someone whose role comes in after a particular task is done, can choose to “watch” aboard. The previous allows them to get notified whenever tasks are completed within that board. Communication is made possible through @mentions, discussion boards and on cross-board comments. Similar to social media apps, when a member is mentioned, they immediately get notified. The @mention is an advantageous feature as it almost eliminates the need for long email chains and allows for the quick reception of real-time updates on every aspect of a project. As of this moment, Trello does not have a live chat option available. Trello allows for integration with a lot of apps, some of which make up for its shortcomings in reporting and analytics, milestone tracking, lack of Gantt charts, etc. Using these gives boards the functionalities of an independent app. Unlimited integrations are, however, only available to paid subscription users. *Discounts available for registered non-profit organizations and educational institutions. Trello is ideal for you if you are a visual thinker, as it puts all the information you need in front of your eyes simultaneously. 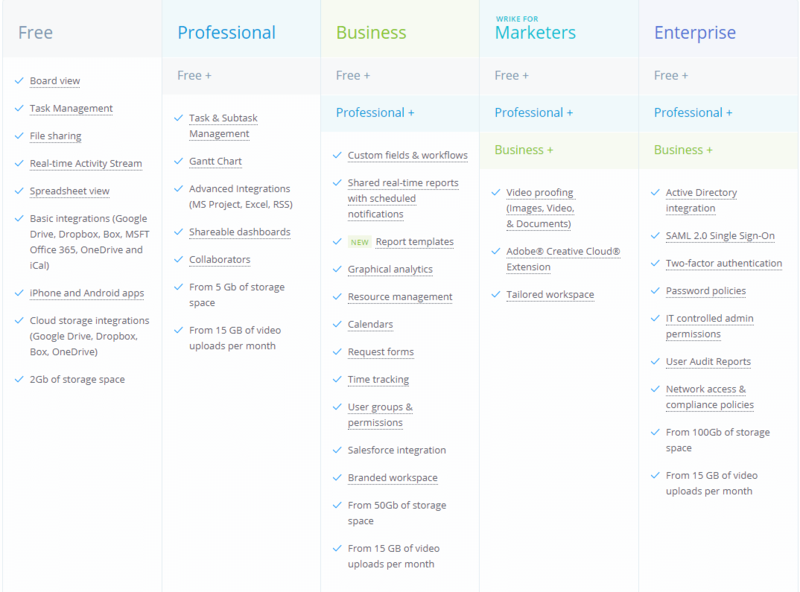 In most cases, Trello is much better for Solopreneurs, freelancers, startups, or small companies. While the Kanban board is very useful at a small scale, it gets extremely hard to use when you’re tackling numerous projects at the same time. Wrike is a flexible cloud-based collaboration and project management solution. Below you can find listed the advantages and disadvantages. One of Wrike’s best features is its inbuilt Gantt chart – arguably one of the most useful tools in project planning.you can easily edit Gantt charts in Wrike with a click-and-drag function. You can use them to illustrate not only project schedules, but also task dependencies. This allows you not only to track a project’s progress but also note the cause and effect relationship between tasks. It can aid your attempts in identifying potential bottlenecks or delays. Recurring tasks is the automation of business processes that repeat over time, periodically or not. In this way, Wrike allows you to automate specific tasks, saving you the time and cost of starting the duties repeatedly from scratch. Your Wrike group activity stream immediately shows all the actions that you have performed within projects you are involved in or teams you are a part of. This is especially useful for project managers and members whose tasks are dependent on others. Also, members can @mention others whenever their attention is needed, making communication between team members highly efficient. Wrike also offers a “proofing” tool. The proofing tool can be used by teams involved in creative work to leave visual feedback through the use of markers and comments directly on an uploaded file. Another strong feature Wrike has over some of its competitors, including Trello, is its inbuilt function for reporting. These reports present, at a glance, the number of tasks at every stage and also what tasks each team member has completed or is in the progress of finishing the work. This is a great tool to use for human resource management – when trying to avoid overworking certain members and underworking others. It can also be used when trying to quickly spot a responsible party for a delay in the chain. While Trello excels at small-scale projects, Wrike is THE tool you’d go for anything larger. If you’re managing multiple projects with multiple teams, the added Wrike features (i.e. Gantt chart) would be significantly more helpful than Trello. So, to sum it all up – which PM tool do you go for? Trello is the better option for you if you depend on the visual understanding of the project’s responsibilities. Moreover, its features make it the better option for freelancers, solopreneurs, visual designers, front-end developers and small to medium-small projects in general. On the other hand, Wrike is the better option for projects that need to scale rapidly, as its features suit a more complex project management suite. Sometimes, however, a project management tool simply doesn’t cut it. Once your business starts scaling rapidly, especially if you are a SaaS company, you will need a solution that completely helps you automate your business processes, workflows and all the tasks associated with the processes. Then BPM software is the answer to most of your problems. One such solution is Tallyfy. A cloud-based business process management and workflow software that scales alongside your product. If you are not quite sure that Tallyfy is the best fit, you can sign up for free, take it for a spin, and decide only afterward whether you want to upgrade to the pro plan. We’d love to hear your feedback on the app. Now, back to you. Did you enjoy the guide? Have you used either PM tool in the past? Let us know your thoughts down in the comments!